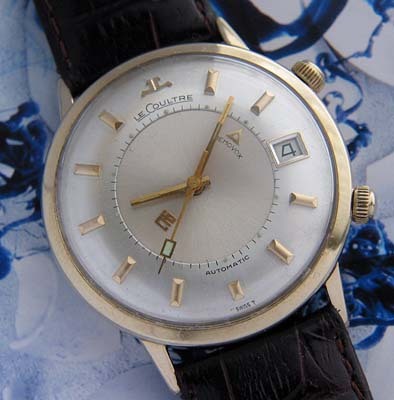 Large size vintage LeCoultre Memovox, rare with date and automatic movement. This vintage LeCoultre Memovox is in very clean condition and sports a few extra features not readily found in others on the market. Most notable is the larger sized case, which is gold filled and fully signed. 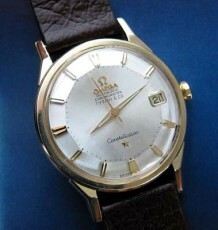 The watch is fitted with the automatic LeCoultre calibre 916 with calendar. Again most Memovox models you will encounter are fitted with manual wind movements. The all-original dial is a satin finish white dial with gold applied stick markers and a date display at 3 o’clock. 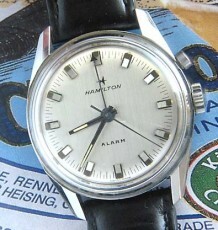 The condition and finish on the dial is immaculate. The dual crowns are identical to another model I have seen in steel and I suspect these are the original crowns as the only one I have seen with signed JLC crowns used ones that were too large for the recessed slots on the case and looked out of place. 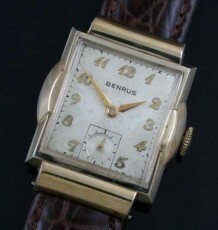 The fully signed gold-filled case measures 36 mm wide by 41 mm long and has no wear through the gold capping. 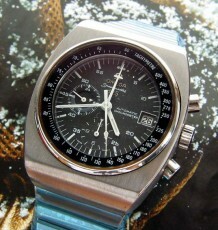 The watch will be supplied on a black or brown leather strap.